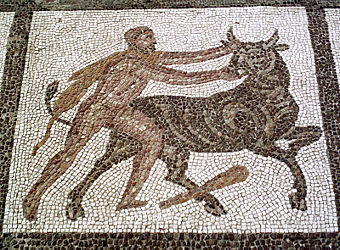 Heracles wrestled with the Marathonian or Cretan bull, and brought it back to Greece; it was his seventh labor. In Greek mythology, the Marathonian Bull or Cretan Bull was a savage bull who lived on the island of Crete. He was captured by the Greek hero Heracles, as his seventh labor, who brought him back to Greece, but then it was allowed to roam free in the vicinity of Marathon. Later, it was captured by the Athenian hero Theseus. In another account, the bull carried Europa to Crete; in another account, the bull was loved by Pasiphae and was the parent of the Minotaur. .. This page was last modified 19:48, 17 April 2010.